Morgan Freeman: No Black President For U.S. Yet The Oscar-winning actor known for films such as The Shawshank Redemption and The Dark Knight talks about his latest project, The Magic of Belle Isle, and his interests outside film — including presidential politics. Oscar-winning actor Morgan Freeman joined Tell Me More host Michel Martin to discuss his new movie, The Magic of Belle Isle. But the prolific actor, famous for his roles in films such as The Shawshank Redemption, Million Dollar Baby and The Dark Knight, also had a lot to say about politics. He was especially interested in talking about President Obama, and why Freeman thinks he should not be called America's first black president. 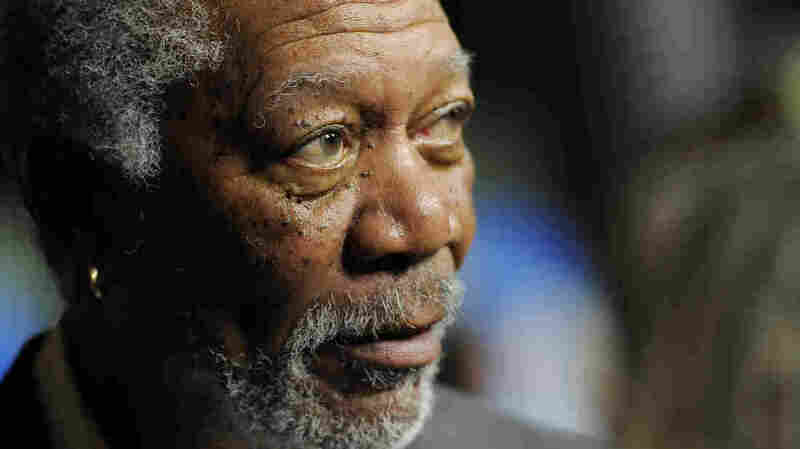 "First thing that always pops into my head regarding our president is that all of the people who are setting up this barrier for him ... they just conveniently forget that Barack had a mama, and she was white — very white American, Kansas, middle of America," Freeman said. "There was no argument about who he is or what he is. America's first black president hasn't arisen yet. He's not America's first black president — he's America's first mixed-race president." Many of Freeman's films explore important chapters of African-American history: Amistad was about the trans-Atlantic slave trade; Driving Miss Daisy was set in the civil rights era; and Glory centered on an all-black regiment in the Civil War. Freeman says he has been disappointed by what he considers unfair treatment of Obama by his political opponents. "He is being purposely, purposely thwarted by the Republican Party, who started out at the beginning of his tenure by saying, 'We are going to do whatever is necessary to make sure that he's only going to serve one term,' " he said. "That means they will not cooperate with him on anything. So to say he's ineffective is a misappropriation of the facts." Morgan Freeman plays Monte Wildhorn in The Magic of Belle Isle. Freeman said there are many reasons The Magic of Belle Isle appealed to him, and his role presented a great opportunity. For one, he said, "It was my chance to play a drunk." Freeman plays Monte Wildhorn, a Western novelist who is partially paralyzed, suffers from writers block and has a serious drinking habit. One summer, Wildhorn becomes the live-in caretaker of a cabin at Belle Isle. He befriends the family next-door, becomes a mentor to one of the kids and ultimately gains a new outlook on life. Freeman acknowledged that he once had an alcohol problem, but he said he didn't draw upon that experience for the role. "Because I was not an alcoholic," Freeman said. "I guess Monte wasn't what you call an alcoholic; he just stayed drunk all the time. He was just, like, numbing himself. I suppose that's what I was doing when I was drinking too much. But I was working every day sober. I was just drinking too much every night." 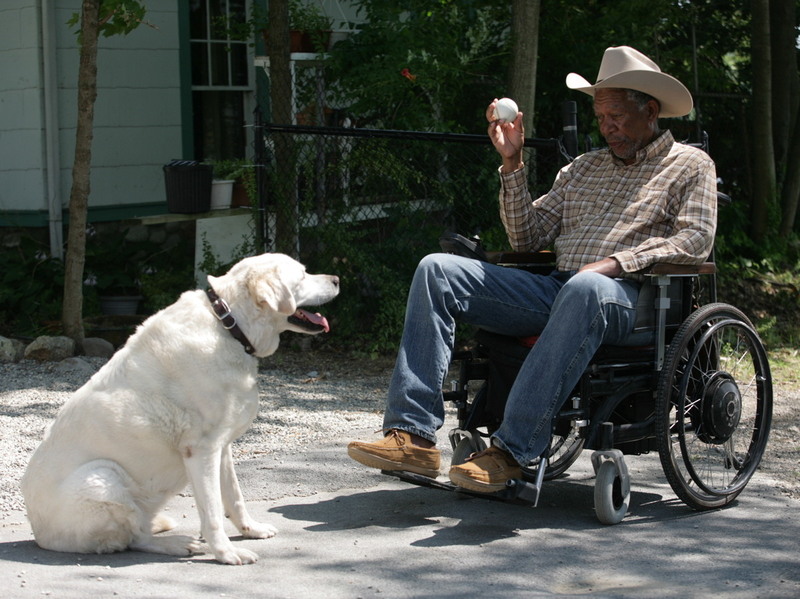 Freeman also enjoyed collaborating with Oscar-nominated actress Virginia Madsen and director Rob Reiner. "He's great fun to work with," Freeman said of Reiner, whom he called one of his favorite directors. "Rob is a hugger and I'm a hugger, so every day, we had to have a hug." In June, the Ford's Theatre Society awarded Freeman (along with Nobel laureate Elie Wiesel) the Lincoln Medal of Honor. It goes to people who the society feels embody the values of Abraham Lincoln. Freeman was recognized for his work promoting education and for his post-Hurricane Katrina rebuilding efforts. "If your life turns out to be good and you have a tremendous amount of luck in your life, it's a good thing to turn around and make it work for others," he said. One of Freeman's latest educational ventures is the third season of the series Through the Wormhole with Morgan Freeman on the Science Channel. He finds scientific inquiry inspiring. "If we say, 'Oh, my goodness ... we think we've found another Earthlike planet,' we will start trying to figure out how to get there. And I have this strong belief that whatever we think we can do, whatever we can dream, we can do," said Freeman. The actor credits that belief for his success, and he encourages young people to follow their dreams as well. "The surest way to fail anything is to quit," he said. "Very often, you know, you stop walking because you say, 'Well, I'm tired of climbing this hill. I'm never going to get to the top.' And you're only two steps from the top."